These causation factors pertained to the truck driver, traffic conditions and roadway conditions. The sample evaluated for this study consisted of 963 crashes involving 1,123 large trucks and 959 vehicles that were not trucks. In this sample alone, there were 249 fatalities and 1,654 injuries. Other causation factors involved in the study included use of alcohol by drivers, tire blowouts, snow and other challenging weather conditions, driver training and experience, cargo shifts, and physical impairment of the driver, caused by a heart attack or seizure, for example. In Washington State, we see these factors at work in many of the truck accidents that injured our clients or killed their loved ones. Steep hills in Seattle and the prevalence of logging trucks in many areas of Washington State are key factors in large truck crashes in this part of the country. A close examination of the truck driver's log can pinpoint causes such as driver fatigue (due to inadequate rest periods) and inadequate truck maintenance. If you have a claim for injuries or death resulting from a trucking accident, your recovery will depend upon whether you can establish that negligence was a cause of the crash. Often times there are multiple causes of a crash, and in order to put you in the best position to secure full and fair compensation, it is very important that all causes of the crash are identified. For this reason, it is essential that a thorough investigation is conducted in all serious truck crash cases. You cannot trust the trucking company or insurance company to conduct a full investigation, or to reveal the true results of their investigation to you. Although law enforcement usually report to large truck crashes and perform some form of an investigation, the police investigation is usually somewhat cursory and does not go into the depth necessary to fully determine the causes of the crash. We recommend that if you or a loved one was involved in a crash with a semi-truck, 18-wheeler, tractor-trailer, or other commercial trucking vehicle that you promptly consult with a lawyer to make sure that a proper investigation is conducted. Some evidence may be lost if not promptly collected, such as skid marks on the roadway, which must be photographed and measured to determine what happened in the crash. 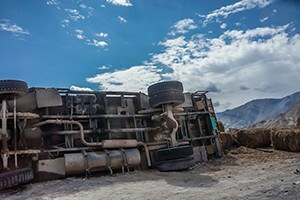 The lawyers at Kraft Davies, PLLC, are experienced with truck crash cases and are familiar with how to conduct a proper investigation into the causes of the crash. When necessary we involve outside experts such as engineers and accident scene reconstructionists to help figure out what truly happened. We handle cases all over the State of Washington, including Seattle, Tacoma, Everett, Bellevue, Bellingham, Vancouver, Olympia, Yakima, Shelton, Port Angeles, Hoquiam, Spokane, Wenatchee, and the Tri-Cities. If you or a loved one has been involved in a crash, call us today to hear how we may be able to help you. You may contact us online through the website, or call us at 206.624.8844 for a free consultation.